Several years ago I picked up a game called Golden Sun. I played through, collected all of the Djinn, became emotionally involved with the storyline, and giggled with demonic glee after killing the last boss despite watching Felix get away. Shortly after my conquests, I heard news of Golden Sun: The Lost Age. I waited for its arrival and learned the other half of the story as I played as Felix’s crew of Adepts. I actually became so absorbed in the story that I cried at the end (My girliest gamer moment). Years passed, I occasionally replayed these games while wondering if there was more to the story than what I had been given. Something didn’t seem right in Weyard. 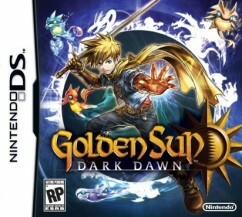 My suspicions were proven correct last year when Golden Sun: Dark Dawn was released. I was immediately excited and wary at the same time. Would a third sequel with a nine year time gap really fulfill my childhood expectations of a perfect RPG? Turning the game on revealed vastly improved graphics, until I entered my first battle. Yes, the graphics are much better, but I was disappointed to see the characters still look a tad too blocky in comparison to the Djinn, Summonings, and Psynergy attacks. They are on par with most Nintendo DS top games‘ graphics, but I had higher expectations from the initial scenes (this tends to happen to me a lot so I may just be too hopeful). The attacks look gorgeous and I still eagerly watch then to see if there is something I missed the first few times I used them. The Djinn are plentiful, but most are still out of the way in the usual Golden Sun fashion. One of my favorite parts of the game was figuring out how to grab each Djinni that seemed to be just out of my reach. The Djinn perform a wider variety of services for the party and I found myself using them much more than I had in previous games. Now for the storyline…You begin as the children of the Heroes of Vale who starred in the original Golden Sun games. You will never forget this fact because it comes up every five to ten minutes. The game sports an internal dictionary that explains certain words for players that are not familiar with the storyline when you see them by tapping them or clicking L or R. I found this amusing until I realized that the majority of words that are defined by the characters using them a sentence or two later. This happens mostly in the beginning of the game but occasionally pops up later in the game. These factors are annoying, but they are easily ignorable as the storyline takes a life of its own as you characters travel from their home and begin finding out what has really happened since the Golden Sun event. The puzzles gradually increase with difficulty, there isn’t a vast amount of “level grinding” required to keep up with the monsters and bosses that you encounter, and the interactive dialogue rarely gives too much away. Golden Sun: Dark Dawn embraces what makes an RPG truly enjoyable. The story is involved, the characters are well rounded and unique (even the mostly voiceless main character), the bosses are unique and appropriate, Alex is still the possibly evil and confusingly loveable character that he has always been, I will replay this game several times, and I definitely suggest buying this game.